Our Top 10 Recommended Websites! There are many free translation websites on the web. They offer instant Machine Translation services which will translate your documents, short texts, phrases and emails, all in and out of a multitude of language combinations. Will a Free Online Translator do the job? 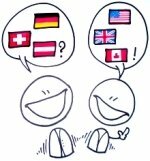 If you're not sure that a machine translation provided by a free online translator is what you need, maybe you should think about these points first and be aware of what makes a "good" German translation. Here is our table of selected providers in descending order of functionality. Try them and see the results for yourself. Enter your email text and the receipient's email address into the entry field, and specify the language in which it should be sent. TIP! Many of these websites encourage you to purchase translation software. Before purchasing, don't forget to review the best translation software available for German translation.